"They were the footprints of a gigantic hound!" The Great Detective embarks upon his most terrifying case, when an ancient curse threatens to claim the life of the last surviving member of the Baskerville family. Does a demonic hound stalk the moor at night? 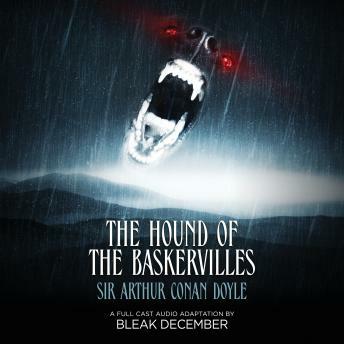 Sir Arthur Conan Doyle''s classic tale of mystery is brought to life in this lushly-scored, full-cast audio adaptation featuring Sir Derek Jacobi (Cadfael, Gladiator) as Sherlock Holmes with Anthony D.P. Mann as Dr. Watson. Cast: Sir Derek Jacobi (Sherlock Holmes), Anthony D.P. Mann (Dr. Watson), Ilke Hincer (Sir Henry), Amie Bello (Mrs. Barrymore), Nikolas Yuen (Mortimer), Barry Yuen (Stapleton), Lisa Morrissey (Hotel Attendant), James Hoegerl (Boy), Richard Boyer (Policeman). Music by Brent Holland.